Archaeologists hope a major find in a spring an hour and a half south of Tampa helps piece together how Florida's earliest inhabitants lived. On Friday, dive teams from the Florida Aquarium and the University of Miami exploring and excavating Little Salt Spring in southern Sarasota County carried to the surface a spear that dates back about 10,000 years. When archaeologists put pieces of it back together, the artifact will measure more than a foot long. "You're not just doing research for research sake," said Mike Terrell, dive training supervisor for the Florida Aquarium. "You are the steward of another culture that can't tell their story anymore because they're just simply not around." 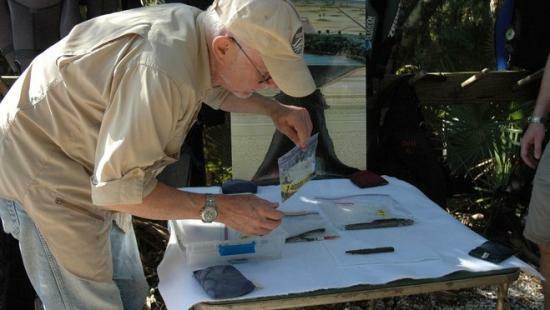 John Gifford handles artifacts dating back 10,000 years. Gifford, an underwater archaeologist at the University of Miami, and dive team members studied the spear. The archaeologists believe they have found the remains of camp sites or prehistoric garbage dumps. What makes the underground site so unique is that the water entering the spring at about 250 feet deep has been underground for so long, it doesn't contain oxygen. There are no microbes or bacteria which normally destroy such relics. "We've already recovered a remarkable range of artifacts that are not to be found anywhere else, because of this unique water environment," said John Gifford, an underwater archaeologist at the University of Miami. Scientists eventually hope to learn more about when humans first started living in Florida and more about how our earliest ancestors lived. "We are already on our way to doing that simply because we have far more organic remains here than you'll find at 98 percent of most archaeological sites in the world," Gifford said. "When you have lots and lots of preserved physical remains, you have a much better chance of reconstructing a life way." He said scientists have never found such a spear in this good of condition. Wooden and charcoal items found nearby test dated to be about 9,300 years old. "To know that you're in a place human hands haven't seen or touched in at least 10,000 years is really, really cool," Terrell said, "It's a really unique experience to be on the forefront of literally rewriting that history and writing a story that's never even been written before." The piece will now go to Texas A&M University, which has one of the most prestigious departments for conservation of water-logged artifacts, Gifford said. "At some point this will definitely wind up at a museum," he said.